Yes, it’s true, we’ve been ’round the market block for two years ! And that is worth celebrating. As our much loved Northcote Social Club undergoes a facelift, we’ve found a new venue and a partner to bring you a market of sustainable handmade. With cake. Satuday August 8th 11am – 3pm. Stallholders cleverly making sustainable handmade are invited to apply to join us at this fantastic market. Please apply here. 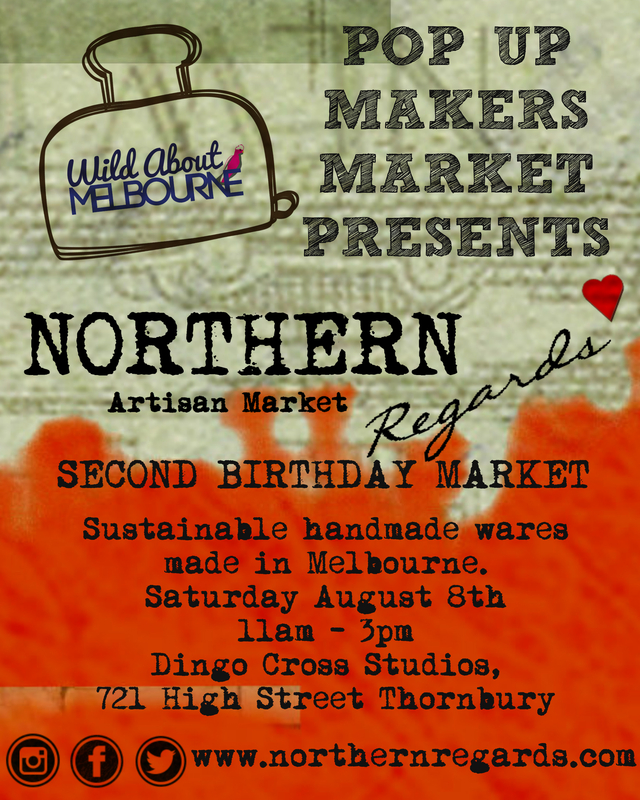 We can’t wait to bring the best of Melbourne’s sustainable handmade to Thornbury and look forward to seeing you then ! This entry was posted in Uncategorized and tagged artisan, Dingo Cross Studios, Handmade, Northern Regards Artisan Market, Second Birthday, Sustainable, sustainable handmade, Thornbury, Wild About Melbourne Pop Up Makers Market. Bookmark the permalink. 1 Response to It’s our SECOND Birthday ! It’s Janet Buick of Slow Spun spinning and knitting. I was wondering if you still had any spots available at your August 8th market? I’d be after a large table stall.